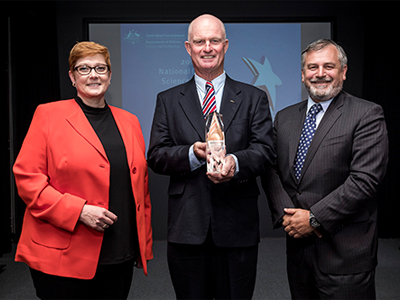 Minister for Defence Senator the Hon Marise Payne, the 2016 Minister’s Award for Achievement in Defence Science recipient Dr Brian Ferguson and Chief Defence Scientist Dr Alex Zelinsky. Defence scientist Dr Brian Ferguson who has exploited the science of sound to pinpoint military threats underwater and over land has won the 2016 Minister’s Award for Achievement in Defence Science. Minister for Defence, Senator the Hon Marise Payne, congratulated Dr Ferguson for his world-leading research in acoustics and signal processing which has contributed significantly to Defence capability by detecting, classifying and tracking targets of military interest. Dr Ferguson has broken new ground with his innovative research into advanced acoustic technologies which are being used in Australian and US operational systems for improved situational awareness and surveillance. His extensive studies established a direct connection between acoustic signals and the course, speed and identity of ships, submarines, aircraft and even speeding bullets. An acoustic system based on Dr Ferguson’s studies accurately geolocated mortar fire from insurgents during Operation Iraqi Freedom and saved the lives of coalition forces and innocent civilians. Dr Ferguson also developed new data processing techniques which have enabled Navy’s sonar operators to identify targets at significantly greater distances than before, allowed submerged submarines to track aircraft flying overhead and improved safety in Navy’s mine hunting operations by delivering acoustic imagery for examining mine-like objects from safe distances. Thanks to Dr Ferguson’s innovative research, our submarines have significantly improved their detection capability over increased distances, our ports and harbours are better protected against threats and even the ecologically sensitive Great Barrier Reef benefits from a higher level of protection against intrusions from commercial shipping.